Seaweeds are so much more than sushi or compost. Emma Richardson explains why we need New Zealand’s 900 species of algae more than they need us. I’m submerged in the sea when white water rises and flows around my face. All I see is foam. It’s August and I’m snorkelling around the rocks at Leisure Island (Motoriki), off the coast of the Bay of Plenty at Mount Maunganui. It is cold, very cold. Feeling the overwhelming weight of the chill, I reach out to the rocks, grateful as always for my wetsuit gloves and hood. From out of the watery fog, what looks like a thick brown web appears. When its elongated, arm-like strands touch my skin, it feels soft and leathery. Gradually I focus my eyes on it: a brown, stringy mat of plant material, swaying in the undulating water. It is a marine algae, Ecklonia radiata, commonly known as brown seaweed or kelp. This seaweed is an old friend. I duck dive down and look up at the mass above me. Suspended there for a second, I think of the words of New Zealand’s authority on marine algae, Wendy Nelson: “Seaweeds have an immense beauty.” I agree. As a marine scientist, my heart was lost long ago to these algae due to their diversity and unusual appearance. What’s more, seaweed helps me re-connect with the natural world. From when I first pick up a piece of kelp, I work out how, in my mind, it relates to other marine creatures. What interests me most of all is the connection one piece of seaweed has with its environment, and making sense of how seaweeds are important. But while they fascinate me, algae don’t get a lot of attention from scientists or the public. “People don’t see them,” Wendy Nelson says. “[Seaweeds] are competing for attention with dolphins and sharks and are not so obvious in the water.” Their obscurity comes partly from our limited knowledge of them, and partly from the fact that they are so difficult to identify and understand. So why should you care about them? Well, seaweeds are integral in our daily lives – and not just to decorate sandcastles or to wrap around sushi – but to feed many fish species, sustain ecosystems and support multimillion-dollar international industries. We need seaweed a lot more than it needs us. You might think you know what seaweed looks like, but you’re probably only imagining one of approximately 900 species in New Zealand waters alone. Seaweeds are immensely diverse, with some species growing up to 10cm per day, while others are no bigger than my fingernail. They can be green, brown, red and black. No wonder Wendy Nelson has described them as “biologically intriguing.” They survive easily in their watery habitats, and even though most of us think that they are just plants of the sea, they are unrelated to land plants. They first appeared well before the dinosaurs. Just about every living thing in the ocean needs seaweeds: for food, habitat and protection from the sea itself. Imagine walking through a forest, but being able to float and glide. 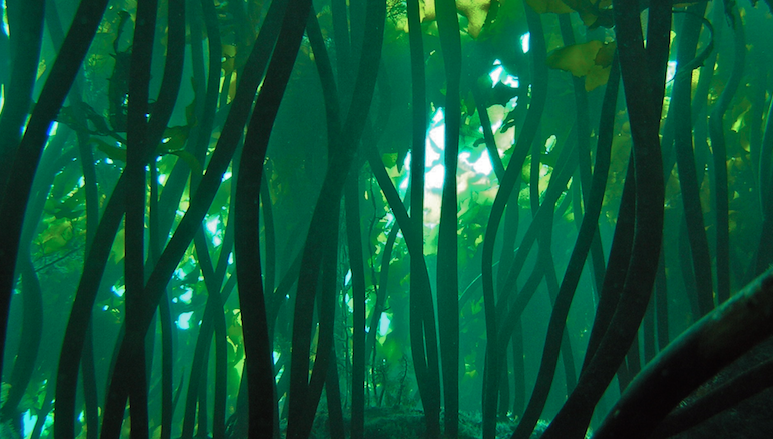 Well, snorkeling through a kelp forest feels a bit like flying through the Amazon jungle. Like trees in a forest, which provide canopy and shade for animals, and space for life to settle and grow, seaweeds provide the foundations to many food webs and give the whole ecosystem its structure. In the Bay of Plenty, Ecklonia is the dominant seaweed. It grows in vast forests on rocky shorelines, mostly around 10-20m in depth, and up to 1.5m in length. Many fish (such as leatherjackets and butterfish) and invertebrate species (such as isopods and molluscs) depend on it. Ecklonia also enjoys the turbulent exposed surge from waves and tides, and so this underwater jungle can act as a shock absorber in storms, protecting the land. Ecklonia also helps feed the spiny sea urchins known as kina (Evechinus chloroticus), which in turn feed snapper. Imagine the snapper, Ecklonia and kina populations as a child’s seesaw. When the populations are relatively equal, there is a balance: seaweed diversity is high and populations of kina and Ecklonia are maintained. When the seesaw is out of balance – for example, when snapper is overfished – gangs of kina rampage over the kelp forests. Conversely, in a marine reserve where there is no fishing, snapper numbers increase, kina gangs are small and Ecklonia flourish, supporting other marine algae species. Back on land, algae in New Zealand have the potential to be big business. Seaweeds have an incredibly broad range of uses, such as being an ingredient in MSG, toothpaste, ice cream, the soft centre in some chocolates and even DNA-fingerprinting technology. Any laboratory undertaking biochemical testing will be using a derivative of algae known as agar. Agar, once processed, can make up to $50 per kg on world markets. However, because of time and expense, harvesting of algae is currently only small scale around New Zealand’s coastline. Unfortunately, the seaweeds that are essential to our lifestyles are under threat from many directions. For starters, sedimentation reduces the clarity of water and makes it more difficult for algae to absorb sunlight through the water. Also, chemicals from sewage and fertilisers pollute the water, which can have devastating effects for some seaweed populations, and cause a population explosion for others (for example, sea lettuce). Other human developments such as building marinas and houses, reclamation of land, dredging, and shoreline erosion can all negatively impact on seaweeds. In recent years, the main threat has come from invasive algae species taking over New Zealand species’ habitat and replacing them. With the continued march of globalisation, shipping traffic has increased and extra migrants that are difficult to detect can easily arrive. The main culprit is Undaria pinnatifida or wakame, originally from Japan. According to Wendy Nelson, the problem is two-fold: Undaria is fertile all year round in New Zealand (unlike in Japan), so can spread quickly and, once established, provides a darker forest canopy, affecting the ability of other organisms to survive in that habitat. Another major threat is the old adage that we don’t know what we don’t know. As Wendy Nelson points out, many seaweed species have yet to be thoroughly studied in New Zealand, and many of the species that have been discovered have only just been named. What’s more, predictions about sea levels rising and sea temperatures increasing in response to climate change may lead us to look towards these macro algae: ancient species which have experienced such stresses before and may adapt easily. For instance, algae may be used to help buffer climate change by taking in extra carbon from oceans. Also, species that survive in warmer waters may begin to populate those regions and become the basis of their food webs. In fact, odds are that seaweed will help solve problems that haven’t even been posed yet. Emma Richardson is a marine biologist based in Bay of Plenty with 19 years experience of working. Her experience with seaweed and marine systems includes 19 years work in New Zealand and overseas. Most recently she has turned to her love of words and is writing about the natural world. This article was originally featured in the summer issue of Forest & Bird’s Magazine. If you would like to receive a copy of your own, please consider joining us. Guest Blogger has contributed 11 entries to our website, so far. View entries by Guest Blogger. Awesome article, I find seaweed very interesting. I imagine phycology(?) is a fascinating and rather complex branch of study.